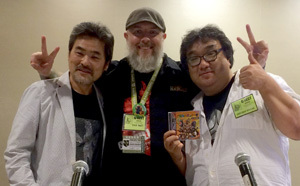 Sojiro Uchino, Kyle and Hiroshi Sagae share the monstrous project: GOTOUCHI KAIJU during G-Fest XXIII. Hey folks, welcome to episode 182. This was recorded live at G-Fest XXIII in Chicago, Illinois and my guests were two awesome superstars from Japan. I failed to give them a proper introduction in the panel, so I am going to do it right now (and beg the Gotouchi Kaiju for forgiveness!) thanks to the G-Fest guest page. Hiroshi Sagae is a master maquette sculptor, and model maker for the film and toy collectibles industries. He has contributed maquette sculpts and miniature work for numerous modern-day Godzilla and Gamera films, and most recently did sculpting work on Ultraman Saga in 2012. A super kaiju-fan in his native Japan, Sojiro Uchino had small roles in episodes of Ultra-Q and Ultraman, as well as playing one of the Boy Scouts (along with Carl Craig) in Gamera vs. Viras. He is currently directing the Gotouchi Kaiju Project with Hiroshi Sagae. These two are doing something that is absolutely amazing – and truth be told, I had no idea what a big deal it was until I met them at the convention. It was a thrill and an honor to talk to them about their Gotouchi Kaiju project, so I hope you enjoy what you hear in this live podcast panel that I titled “Regional Kaiju-ology”! And you should totally check out that Katokutai Band, too; they cover a lot of tokusatsu songs (and write originals). Uchino-san thinks they would be a great addition to G-Fest and I completely agree. Check out their videos – especially the Ultraman Leo cover and their video with Bin Furuya, the original Ultraman suit actor. I hope I can catch a performance during one of my visits to Japan. Oh, and the keyboard player is in the Garamones too!